$1,000 Vegetarian Menu at NYC Benefit. Duck, a *Special Request Asterisk. NYMag's Grub Street editors snicker that there may be a lot of grimacing faces at the $1,000 a plate Global Environmental Citizen Awards, honouring Queen Noor of Jordan and Edward Norton. Guests will be faced with a Sweet Potato Dolma entree and other veggie delights as their written menu. However, problem diners can special request the Duck Leg. Grub Street reports that the Harvard Club event will forgo the 'meat' menu altogether. 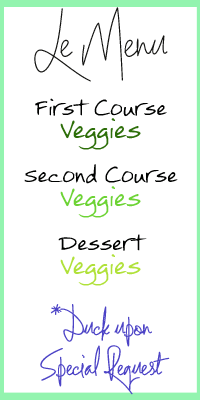 For the first time, the menu is 100% vegetarian. Foodie Celebs like Alice Waters will be in attendance. And award-winning chef Dan Barber of Blue Hill at Stone Barns will prepare the menu titled: Tastes from the Greenhouse, Gardens and Fields. Wow! Turning the tables on the special requests! I have never seen a gourmet special event menu have all vegetarian options and the *special request asterisk is reserved for the carnivores. I give two big green thumbs up to Dan Barber and the Harvard Center for Health and the Global Environment for making this decision.